1. The Environmental Communication under the magnifying lens.- 2. Journalism and Environment: two opposed trends which attract each other.- 3. Which shades of “green” are the new Nets of communication disseminating?.- 4. Communicating the Environment at the state of art. Ciak /Action!- 5. Communicating the Environment in the Green and Circular Economy.- 6. Communicating the Environment is a “public right and duty”.- 7. 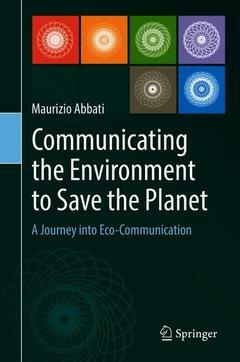 Eco-communication: environmental management, big events and legal eco-language.- Bibliography.